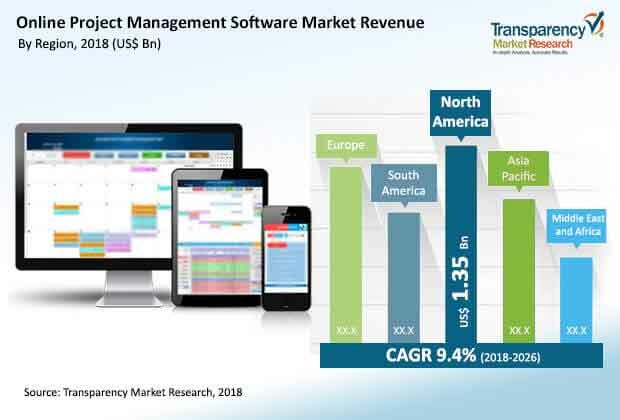 According to a new market report published by Transparency Market Research, the global online project management software market is expected to reach a value of US$ 6.68 Bn by 2026 due to the increasing adoption of cloud-based project management solutions. The market is projected to expand at a CAGR of 9.4% during the forecast period from 2018 to 2026. The market in Asia Pacific is anticipated to experience healthy growth followed by Middle East & Africa during the forecast period. Large enterprises segment holds the dominant share in the global online project management software market, due to the increasing adoption of project management solutions across the globe. Despite sluggish growth of the economy in some regions and a confined IT budget, companies are purchasing project management software solutions in order to efficiently manage and optimize their project resources. Online project management software helps in gaining visibility of the market, easily turning strategy into an actionable plan to achieve success. In addition, online project management software helps to access real time dashboards anywhere and anytime. It also helps the project manager to stay up to date regarding the status of reports and ensure that no last minute details are missed. The rising need for cost management is also one of the factors that is expected to drive the online project management market. Online project management software solutions help in the efficient allocation of resources for a specific job, thereby reducing the overall cost. Enterprises in Americas and Europe operate at much higher costs. Therefore, the adoption of project management software solutions in these regions is continuously growing. The online project management software market is segmented on the basis of end-user and geography. The end-user segment has been further classified into small and medium sized enterprises, large enterprises, and government. According to the research study, large enterprises are anticipated to experience flourishing growth during the forecast period. This is mainly due to the fact that large enterprises are heavily spending on IT infrastructure and technologies. Several large enterprises are also laying emphasis on strengthening their market position by acquiring regional or SME’s across the world. This is further expected to increase the number of projects and activities for companies and project managers. In order to manage and control a large number of projects, organizations are focusing on using online project management software in the near future. Additionally, small and medium sized enterprises are also focusing on investing in IT infrastructure and technologies to enhance their businesses and deliver projects effectively and efficiently with reduced project cost and duration. The research study includes profiles of leading companies operating in the global online project management software market. Some of the key players profiled in the market include Microsoft Corporation, Oracle Corporation, ServiceNow, SAP SE, Autodesk Inc., Unit4, Aconex Ltd., NetSuite, Deltek, Inc., Citrix Systems, Inc., Workfront, Inc., Atlassian Corp PLC, Zoho Corporation, Wrike, Inc., Basecamp, LLC, Smartsheet.com, Inc., Mavenlink, Asana, Inc., monday.com Labs Ltd., and Streamline Media Group, Inc.